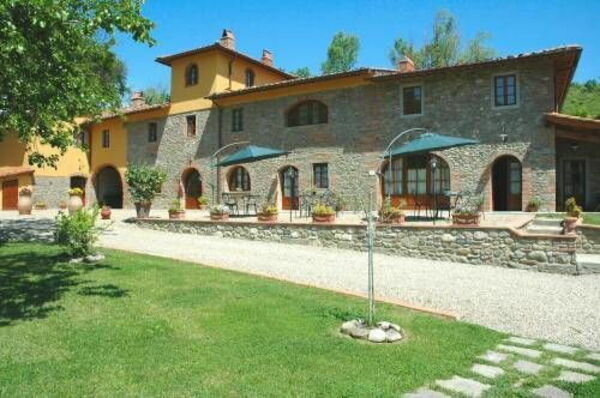 Ancient stone farmhouse situated in quiet and panoramic location among vineyards, olive groves and century-old trees. This property has been recently restored preserving its original architectural features and turned into 8 nice apartments, all of each offering comfortable interiors furnished in a rustic style. The house is on a large 21-hectare estate which is part of the natural reserve “Parco dei Calanchi” and offers the opportunity of a relaxing vacation in close contact with nature. The property is provided with large common rooms. Distances: the small town of Matassino 2 km, Figline Valdarno with all kinds of shops 3 km, Florence 25 km, Siena 50 km, Arezzo 30 km. At guests’ disposal: large well-maintained garden furnished with garden furniture, shared swimming-pool (14 x 6 m – maximum depth 1,5 m – open from 01/05 to 30/09), barbecue, bread oven, walks within the natural Park. Laundry with shared washing-machine (€ 5,- / per washing) and dryer (€ 5,- / per drying). Extra services: mountain-bikes available on request. The olive oil and the wine of the estate are available for the clients to be purchased. Baby bed available on request. Maid service available by arrangement (to be paid locally). 60 m2 Ground floor: large living-room with kitchen corner (oven, freezer, American coffee-maker), dining area (satellite TV) and double sofa-bed, double bedroom, bathroom with shower.